Throughout his 31-year legal career, Chris has been committed to providing exceptional legal representation and personalized legal services to each and every client he represents. During that time, Chris has obtained over 75 six and seven figure verdicts, settlements and arbitration awards for his clients in a wide range of complex personal injury cases and other legal matters including, among others, motor vehicle accidents, medical malpractice, nursing home neglect, catastrophic injuries (severe burn, brain and spinal injuries), construction accidents, workers’ compensation, wrongful death and business disputes. In every case, Chris is dedicated to using his experience, skill and knowledge as a trial attorney to help his clients obtain the compensation they are entitled to under the law. Chris’s extensive and diverse work history in the legal field provides him with a unique perspective on how to successfully litigate cases against large corporations and insurance companies to maximize his client’s chances of success. In 1987, Chris began his legal career in Charlotte at Parker, Poe, Adams & Bernstein, LLP, one of the state’s largest law firms, defending companies in litigation matters in both state and federal courts. In 1993, Chris accepted a position as in-house counsel at First Union Corporation (now Wells Fargo) handling complex litigation cases across the country. As Vice-President and Assistant General Counsel, Chris was also responsible for overseeing and defending the personal injury and risk management cases against the company. 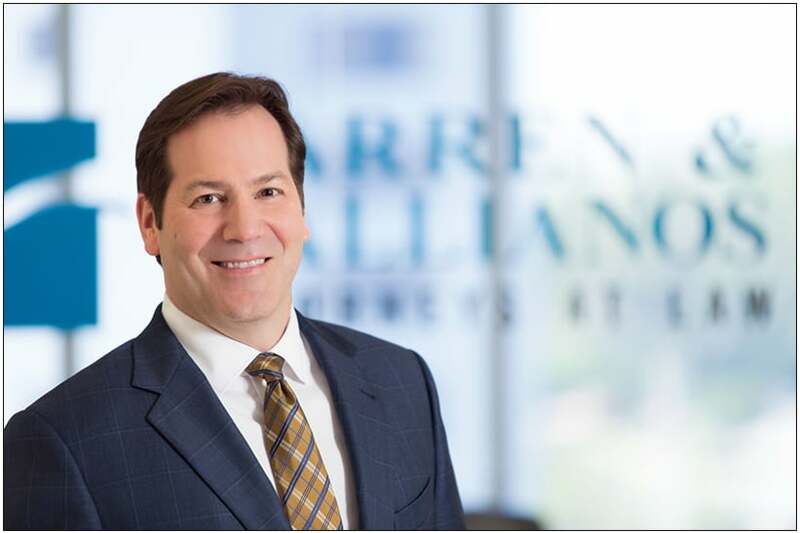 In 1997, Chris joined with his law partner Jeff Warren to form Warren & Kallianos, a personal injury firm exclusively focused on protecting the rights of those injured by the negligence of others. His skill, reputation and accomplishments have been recognized by his peers and numerous state and national organizations and associations, including the Top 100 Trial Lawyers in North Carolina (2009-2018), Super Lawyers (2012-2018), AVVO (Superb rating) and Million Dollar Advocates Forum. In addition to practicing law, Chris believes in public service and the need to support organizations that protect access to justice and the right to a jury trial. Chris has served on the Board of Governors of the North Carolina Advocates for Justice (NCAJ) and is a Sustaining Patron of the NCAJ, one of the state’s leading organizations dedicated to protecting the legal rights of victims of negligence. Chris has also served on the Mecklenburg County Bar Fee Dispute Resolution Committee and Public Information and Education Committee. For six years, Chris also served as Mayor-Pro-Tem and as a Commissioner on the Matthews Town Council in Matthews, North Carolina. Chris was born and raised in North Carolina and is a lifelong native. He is a Phi Beta Kappa graduate of the University of North Carolina at Chapel Hill (UNC) where he studied psychology and business. Chris received his law degree with honors from UNC in 1987. While in law school, Chris served as a member of the North Carolina Law Review and was appointed to the Board of Editors of the North Carolina Law Review. Chris is a published author on topics ranging from medical negligence to bad faith insurance practices. He is admitted in all North Carolina federal and state courts, the United States Court of Federal Claims, and is a Certified North Carolina Superior Court Mediator. Chris has an active life outside the practice of law. He enjoys spending as much time with his family as possible. Chris is married, he has three wonderful daughters who are all married, and three grandchildren. He is an avid golfer, former competitive tennis player, and enjoys working out most days at the YMCA. His hobbies include reading, writing and cooking.